With the aid of this training module you can train extensively in cogwheel tasks, as will await you in the suitability test. Besides cogwheels there is also the possibility of having wheels in the tasks over which a drive belt has been attached. You can set up individually whether the wheels should run crossed or open (i.e. the belt not crossed over). The technical difference is that, as apposed to cogwheels and with crossed belts the two connected wheels turn in the same direction. 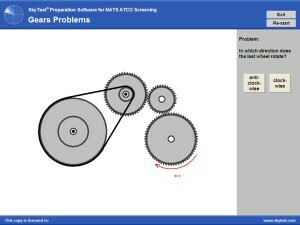 The training software generates all the gearing questions at random. This means that it is practically impossible to get the same set of questions twice. So you may toss around as much as you like without knowing how to solve a task from previous applications.